Zion is one of the most Family Friendly National Parks to visit. Why? Simply because there is an endless amount of things to do here! From hiking, swimming, camping and many other activities, its hard to NOT keep the kiddos busy while staying here. One of the things that separates Zion from the rest is the amount of paved, or low-impact hikes the park has. Which means pushing a stroller, or hiking with really young children can be a lot easier than you’d think. These hikes are perfect for those who have to push strollers, or keep tiny legs going. There are several hikes to choose from including; River Walk, which is a fully paved trail and absolutely beautiful, not to mention river swimming in the summer months! Emerald Pools, depending on how far you want to go you can choose to take a stroller to the waterfall and turn back, or hike with the little ones for the entire time, its actually a fairly short hike. Weeping Rock, this is a fully paved trail, and is very short, however it is a little steep, so be careful! This is great fun for kids! Let them learn and explore on a ranger led activity, where they can accomplish tasks and receive a cool god badge at the end! Zion offers the kids a fun little workbook that keeps them busy on the shuttle and they can take it on the hikes with them to complete. That’s right! Some areas of the Virgin river in Zion you are allowed to swim in! So make sure that you and the littles have some extra clothes or a swimsuit to wear! Make sure you bring plenty of snacks and treats for the little ones to keep their energy up while hiking around. It also helps to pack a lunch as well while you’re out so you can stop and take a break under a shady tree to eat. 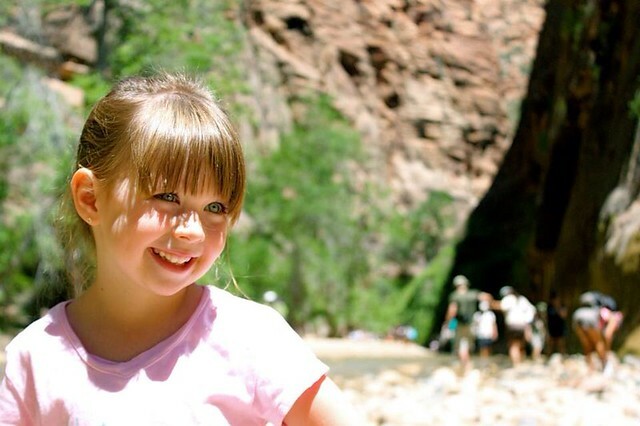 Hopefully these tips will help you with your kids on your next Zion trip!